From a neon blue river to perfectly cone-shaped volcanoes and peaceful mountain villages that look like ski resort towns set in the tropics, Costa Rica’s Northern Region is surely one of the reasons why this country is known as the “Central American Switzerland.” This area extends from the western swamps of the northern Caribbean to Miravalles and Tenorio Volcanoes and is home to some of the country’s most breathtaking destinations: Río Celeste, Arenal Volcano, Monteverde and Sarapiquí. 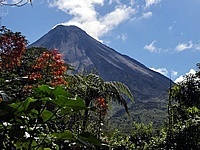 La Fortuna is the closest town to Arenal Volcano and considered by many to be the Adventure Capital of Central America. Visitors to this area are in for a treat as the volcano provides a magnificent backdrop to the day trip adventures. Though not erupting anymore, there are still many hot springs at the base of the volcano and a lot of the resorts offer them right on the grounds. Not a bad way to unwind after a day of adventuring if you ask me! Click on the link above to learn more about La Fortuna. Destination type: Popular destination for tourists. Monteverde is the most famous cloud forest in the world. Birdwatchers come to this area from all over the world in search of the Resplendent Quetzal , Emerald Toucanettes and Bellbirds. Adventurers come for the best ziplines in the world and others come for the sheer beauty as the forest has life on top of life. 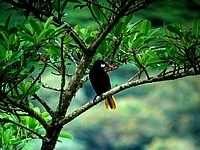 Click on the link above to learn more about Monteverde. The Rio Celeste is home to the most beautiful waterfall in Costa Rica as well as vast expanses of jungle. The river is located within Tenorio National Park, which is also home to the extinct Tenorio Volcano. Most visitors to this area stay in a little town named Bijagua, which is around 10 kilometers from the park entrance. Click on the link above to read more about Rio Celeste. 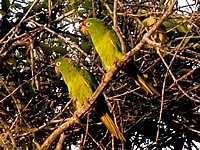 The Sarapiqui region is a well-known birdwatching destination. Most visitors to this area stay in ecolodges near the town of Puerto Viejo. Guided hikes, riverboat rides and whitewater rafting are the main activities in this off the beaten path destination. Click on the link above to read more about Sarapiqui. 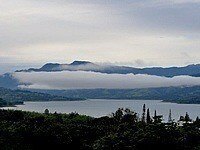 Nuevo Arenal is a quiet village located on the north shore of Lake Arenal. Visitors to this off the beaten path paradise come for the local feel, birdwatching and activities on the lake such as fishing, wind surfing and wake boarding. Click on the link above to learn more about Nuevo Arenal. 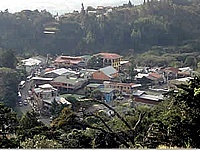 Santa Elena is the main village in the Monteverde region. This small cloud forest town has played host to many birdwatchers and canopy zipline thrill seekers over the years. Santa Elena is not only known for birdwatching and ziplining though as it is home to some of the best dining options in Costa Rica. Click on the link above to learn more about Santa Elena.